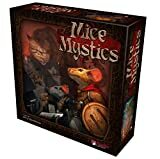 Mice & Mystics is a cooperative campaign based board game where players take on the role of adventuring mice. Using teamwork, courage, and a little luck, the mice will explore their way through a series of interactive chapters trying to save their kingdom. The game uses a simple set of rules that allow players to have all sorts of exciting adventures. Each chapter has its own special rules to give it unique storytelling opportunities. If you read through these special rules as you play, it can slow the game down. Each mouse's turn consists of two phases: one movement and one action phase. 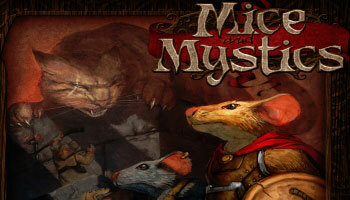 The mice will face countless threats such as rats, cockroaches, mousetraps, spiders and the castle's housecat, Brodie. With the gathered cheese, players can obtain new abilities and improve their characters. Some search cards are listed as party items. Party items are items that can be used freely by any mouse in the party. When a mouse receives a party item, place the card near the story control board and place any marker or token that might be associated with that item in the party stash area of the story control board.